Human space tourists could soon enjoy this view of the sun and Earth as seen from a Zero 2 Infinity balloon test on Nov. 12. Not all space tourism is rocket science. 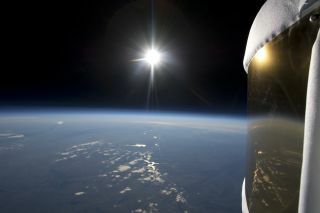 A newly successful test of a balloon could allow paying human customers to enjoy stunning Earth views and the weightless astronaut experience by 2014. The test balloon carried a humanoid robot up to an altitude of almost 20 miles (32 kilometers) on Nov. 12 — just a few miles shy of where skydiver Felix Baumgartner leaped from during his "space dive" in October. Startup Zero 2 Infinity wants to eventually offer hours of flight time for space tourists to do whatever they want in a near-space environment. "Some people will want to tweet," said Jose Mariano Lopez-Urdiales, founder and CEO of Zero 2 Infinity. "Some will want to put down a carpet and pray to mecca. Some people will want to eat their favorite buffalo wings while they're up there." The Spanish company already has waitlist customers who paid an early deposit of almost $13,000 (10,000 euros) as the first installment out of a total ticket price of $143,000 (110,000 euros). It has also attracted funding from the world's second-largest balloon manufacturer, Spain's third-largest bank, and several angel investors by proving its concept step-by-step and by relying on proven helium balloon technologies. Flight testing took place at an Air Force base near Virgen del Camino in Spain. But Lopez-Urdiales envisions future flights launching from many other locations in the country. A typical predawn flight would take several hours to reach maximum altitude, so that passengers could enjoy seeing the sun rise against the blackness of space and see the curvature of the planet Earth. Luckily, the balloon would not need to get anywhere near the 62-mile (100 km) altitude that marks the official edge of space for its riders to enjoy stellar views. Getting back down would mean cutting the cord between the balloon and the enclosed passenger capsule. Passengers could experience about 40 to 60 seconds of weightlessness during free fall, before parachutes and a parafoil carried them safely down to Earth. The recent test flight gave Zero 2 Infinity its first successful test of a balloon capsule large enough to carry humans, but only if the two people spent the entire trip lying down. An earlier flight test scheduled in May was canceled after wind gusts damaged the test balloon. Future versions of the balloons, called "bloons" by the company, would have donut- or bagel-shaped capsules with plenty of standing room for two pilots and four passengers. But the test capsule proved just right for the humanoid robot named Nao — made by Aldebaran Robotics — that stands at knee-height compared to adult humans. The robot rode as a passive passenger, but could someday become an active pilot that tests the controls and life-support technologies meant for humans. "Little by little, we're teaching it how to pilot, but that's at a very early stage," Lopez-Urdiales explained. "The idea in the future is to have humanoid robots testing future complex aerospace vehicles." A small humanoid robot made by Aldebaran Robotics got a ride aboard a balloon intended for space tourism on Nov. 9, 2012. But Zero 2 Infinity doesn't just want to make money. Lopez-Urdiales envisions his balloons carrying scientific experiments or scientists high into Earth's atmosphere. His inspiration for creating the startup company came from his dad, an astrophysicist who worked on an experiment that went with the Cassini-Huygens mission to Saturn's moon Titan. "I was growing up around balloons, rockets and telescopes," Lopez-Urdiales said. "My dad tested a Huygens scientific instrument on a high-altitude balloon." The balloon space tourism's relatively more affordable price tag could also open the eyes of many more people through the "overview effect," Lopez-Urdiales said. Frank White, a communications director at Harvard's Kennedy School of Government, coined the term to describe how astronauts gained a better appreciation of global and environmental issues after seeing the Earth surrounded by the darkness of space. "That's probably the biggest benefit private spaceflight will offer to civilians and members of the public," Lopez-Urdiales said. "The overview effect is personal experience, but then you share it. I think it goes a much longer way than bragging rights."